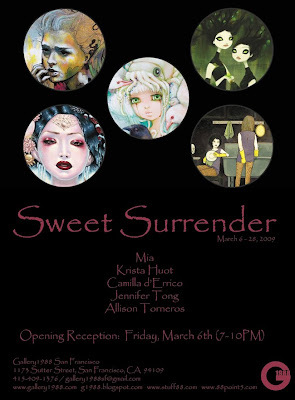 My good friend and talented artist, Jen Tong, will be debuting 12 new paintings in a show called Sweet Surrender. 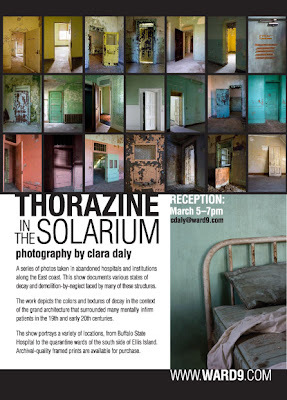 If you're on the west coast (particularly in San Francisco), you should definitely check out this exhibit. Sweet Surrender opens Friday, March 6th at 7PM at Gallery 1988. I am a fan of rusted things - of things in decay and distress. I can't help but find beauty in peeling paint and rotting wood. Ruined things, old things, have a special charm that snare me in their siren's song. Maybe it's because just by looking at them, you can tell that there is a story. Their stories are ones of wear and tear, neglect and abandon, of being cherished or forgotten. I've spent many hours just thinking about the people who came before and their lives and their thoughts and how they interacted with these now faded things and damaged spaces. 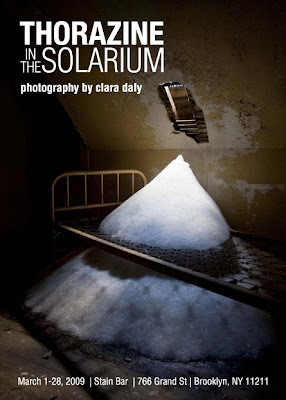 If you like Clara's work, you might also like The Kingston Lounge, a blog dedicated to "guerrilla preservation and urban archaeology" and Brooklynite art photographer Ian Ference. 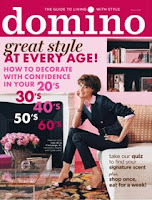 When Domino Magazine first debuted four years ago, both Cynthia and I were very excited. The Lucky Mag for home decor? SCORE! However, as the magazine progressed, I think something was lost in translation. The advertising became overwhelming, almost dominating the content, and the features often left something to be desired. To be blunt, some of the issues just missed the mark completely. The latest March issue is actually really good and has approachable design and a few ideas that I might co-opt for my own apartment. Too bad it's the last issue. Sadly, like many other magazines struggling to survive in a dicey economy, it will fold. (Oddly enough, it'll be for lack of advertising dollars.) At least they will leave on a high note. While running an errand, I stopped at a crosswalk to wait for the light to turn. I was minding my own business and not really thinking of anything but the task at hand. That's when I got a prickly feeling on the back of my neck, that feeling that someone is watching you. My head whipped around and I locked eyes with a pair peeking through the blinds in an apartment building's window. For a moment, we stared at one another. It was such a strange and intense feeling. One of the first rules you learn as a City Dweller is never to look anyone in the eyes. It's a personal and intimate gesture that can either provoke or entice. So, it was definitely an unusual experience that got me thinking about eyes. Below are some of the eye inspired beads, pendants, and finished jewelry. A) Rub-resistant silver-tone eye charm from SteelLace. B) Black and white eye photo charm from BestCharms.com. C) Fine pewter heart's eye bead with the word, "Protect" on the back from Green Girl Studios. D) The Eye of the World lampwork glass bead by Tera Belinsky-Yoder, (Etsy Seller, beadygirlbeads). A) Steel-framed polymer Illuminati Amulet by Etsy Seller, Hibernacula. B) 22mm X 25mm, Rare, large Roman period, blue glass eye beads from Thomas Alexander Stricker of TASART. C) Countess de Castiglione pendant by Etsy Seller, sweetheartsinner. D) Sterling silver crying eye focal bead by the amazing Anne Choi. A) Murano Style Glass lampwork bead (fits Pandora Red Bullseye 14mm) from Beadaholique. B) Fine pewter Open Eye dangle with the word, "Seek" on the back, from Green Girl Studios. C) The Inevitability of Rebellion, collage necklace from L.S. Longo (Etsy Seller, StoriesDivinations). D) White Egyptian Eye on a Black Lip Shell pendant from Fusion Beads. A) Turkish Glass Evil Eye Charm from tulumba.com. B) Tear Stained Eye Pendant Necklace from Etsy Seller dadadreams. C) Star-eyed Sapphire "Upcycled" Barbie pendant from Brooklyn-based artist Margaux Lange, (Etsy Seller, margauxlange) Check out Margaux's blog by CLICKING HERE. D) Embellished fine silver Dragon's Eye pendant from Melissa J. Lee, Etsy Seller, melissajlee. I'm back in the City. It's strange to be back after being away for so long. I came home to a small mountain of paperwork and many errands that needed to be run. Needless to say, there will be a period of adjustment. Not only am I going to have to get used to City dwelling again, but I'll also have to go without my family for a time (at least until I see them in Hawaii). It's strange not waking up to the sound of small feet pitter-pattering down the hall or the smell of a pot of coffee brewing that I haven't put on myself. In other news, I just finished all of the Sookie Stackhouse literature there is to be read that is available. I can't wait until the new book, Dead and Gone, comes out. CLICK HERE to read chapter one. I'm smitten with her world and although I think I might be a little disconcerted at having someone around who can read my mind and know all my darkest secrets, I think that Sookie and I would be good friends. We do both like sweet tea. I also happened to catch Coraline in 3-D. I was a big fan of the book by Neil Gaiman and was happy to see that it was being brought to life on the big screen. I enjoyed it very much. Though to be perfectly honest, I don't think that 3-D is my "thing." I had to sit pretty close to the screen and was pretty motion sick by the end of it. I've been taking it slow getting back into the routine of things. I know there's a mountain of work ahead of me, but I also know that if I just try and dive in, all it'll do is stress me out and not allow me to really focus. I figure that taking some time to decompress and adjust is the smart way of starting. It's party time! Mix it up with your own beaded cocktail! Tammy shows you how and what to do with the mess afterwards. It's cold outside! Get a clasp on things. 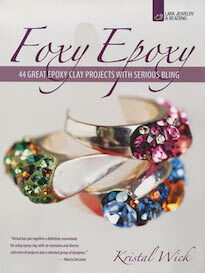 Barbe reviews the fiber jewelry book, "Elements of Style." 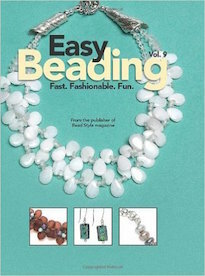 Tips on submitting your work to BeadStyle magazine. Carmi "repurposes" a belt into a new necklace. Combine wirework and embroidery with stringing to make a beautiful one-of-a-kind necklace. Melissa shows off an unusual stash acquisition - mammoth bone beads. 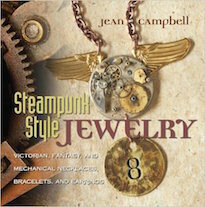 Andrew shares six new earrings designs, utilizing some of his favorite artisan made components. Melanie finishes her Alchemical Glove costume project: an intricately articulated metal glove constructed of brass filigree and jump rings. 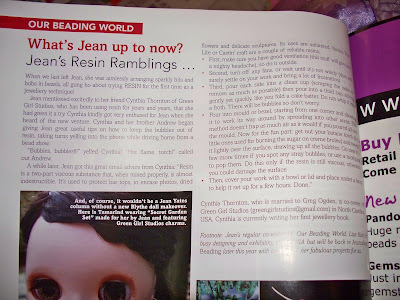 The delightful Jean Yates mentions me in an article she wrote for Australian Beading Magazine entitled, "Jean's Resin Rumblings." The phone interview was actually with my sister, Cynthia, but she had it on speaker phone and I couldn't help but chime in. CLICK HERE for Jean's full coverage of her work in the magazine. Western North Carolina isn't just home to beautiful mountains. It's also the home of the talented and supremely creative Nina Bagley. We've been meaning to meet up for the longest time. Today we finally seized the opportunity! It was SO MUCH FUN! Cynthia and I prepared a feast. I told Nina that we would make a feast in her honor. We started cooking last night. The above picture of caramelized bacon (yep!) was just one of the dishes. To start we had several cheese plates, fresh fruit, and onion and goat cheese puff pastries. Then we moved on to slow cooked beef and cheesy soft polenta. For dessert, we had a pana cotta layered with a homemade strawberry gelatin dessert. Nina brought each of us a gift. 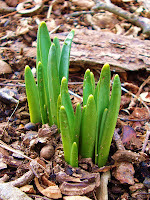 She brought Cynthia and I heart-shaped stones and Azalea a faerie fountain and dish set made of acorns and mica. I felt very honored with my gift and was struck profoundly. Little things make me happy. 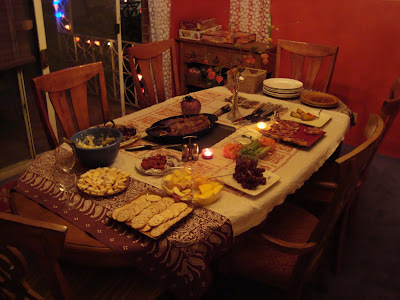 A feast among friends, a laugh from the belly, the giggle of a child, the smell of fresh laundry and the feel of a warm blanket on a cool evening. At the risk of sounding like a song performed by Julie Andrews, these are a few of my favorite things. This particular token of friendship made me extremely happy. I am at my happiest when I'm making things and even more happy when I'm with others who enjoy it as well, others who appreciate the craft of creating. The above picture is a tribute to friendship: I'm holding this new heart stone (that you should see when it's all made up), wearing a bracelet by Heather Wynn (that I haven't taken off since I got it), and wearing a ring that one of my best friends gave me about fifteen or more years ago. Above is a sweet picture of the three of us, Nina Bagley standing with Cynthia Thornton (my sister) and me. A bulk of the work for Cynthia's book, Enchanted Adornments, (due out this November) has just been finished up and turned in. The process has been exhausting and it feels as though we've been running a long race. Of course there's still a lot of work that needs to be done on the book, but the big deadline has been reached! Sweet relief! I find myself thinking off into the future, trying to ponder the age old question of: What's next? In less than a week I'll be heading back to New York. Strange to think how limited my time here in the mountains is. In the beginning of March, I'm meeting up with the family in Hawaii for a bead show and for some rest and relaxation. It'll be nice to lay out in the sun and zen out a little. The ocean has been calling me. Afterwards, there are a lot of different prospects. I am excited with all of the possibility and the potential. If one were to describe and sum up the atmosphere of the Green Girl Studios household, it would be a little four letter word: WORK. All of us have been working hard and the hive has been buzzing with activity. But in the hub-bub of all this, little reminders spring up to bring to our attention that we must enjoy the moment and be mindful of the amazing world around us. For the past few days, I've been, for all intensive purposes, dead to the world. That is, with a few small murmurs of life here and there. 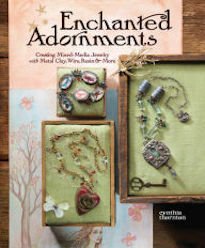 Battling colds and fatigue, we're rounding third base and in the home stretch for Cynthia's book, Enchanted Adornments. It's been a long process and probably more intense than any of Green Girl Studios crew could have ever imagined. It's true that there's a lot more to be done and many miles to cross before a final product is presented neatly in stacks at the local Barnes & Noble, but the major deadline is almost upon us. It comes with mixed feelings - "dread" being one of them and "relief" being another. Will It be what Cynthia has envisioned? Will It reflect all the work, love, and energy that has been poured into this project? What new things will come our way once It is finally released. While finishing up some last minute details, we've been listening to the Sookie Stackhouse books by Charlaine Harris. The most recent one listened to was Dead to the World. Can you say, "Smitten Kitten?" Well, that's me. I can't get enough of these books. Not only are they greatly entertaining, but I can work to them! Normally when listening to books on tape, I sit in perfect quiet stillness, my mouth hanging slightly ajar, eyes gazing off distantly as the words pour into my ears. Luckily this is not the case. One side effect, besides the constant consideration and thinking about of Sookie's world is that many of my thoughts have taken on a slightly more Southern flare and are narrated in a voice not my own, but of the woman who reads them named Johanna Parker. Even these words are ringing in my head in that very distinctive voice! Just wanted to wish all of you out in blog world a Happy Valentine's Day. Eat lots of chocolate! Melissa ponders how the jewelry of one's youth informs a designer's style. The amazing Margot Potter is coming out with a new book, Beyond the Bead, by Margot Potter--next week! Read all about it, here! 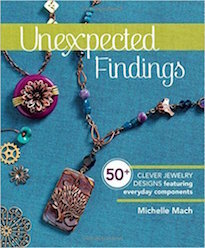 Katie's spreading the beady love with free shipping and a CRYSTALLIZED™ jet twist pendant with your purchase of the new book, Bead & Wire Jewelry Exposed, from her website. Offer ends Thursday, Feb. 19th. Using a bead frame, you can create a special necklace. Melanie is touched by the golden fingertips of creativity, in part two of her earworm inspiration journey. Carmi recreates a vintage embroidered brooch using hand sewn linens. A great new way to share our free earring project e-newsletters with your friends. A kiss inspires the ABS monthly challenge. Is Etsy passe' for jewelry designers? Is it time to move on? Google seems to think so. Here's a clip from the road. Each place has its own magic and I love seeing the country unfurl and fly by the window. If you decide to watch it, watch it all the way through. The background music is Mogwai. On our way back to Asheville, we stopped in Memphis to stay the night with Greg's sister-in-law, Stacey. Although I was pretty tired, we had a lot of fun. Stacey is super nice and a great tour guide for a city she's only been in for a month. 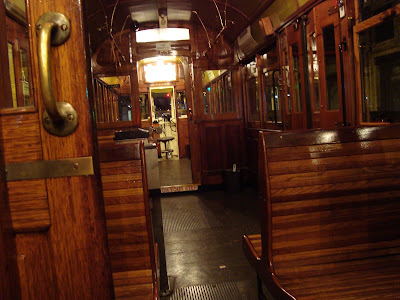 Instead of driving or walking, we took a trolley! I think they're just great. The one we got on was from 1926, was almost all wood, and was from Italy. It was beautiful and the perfect (albeit relaxed) way to get around. 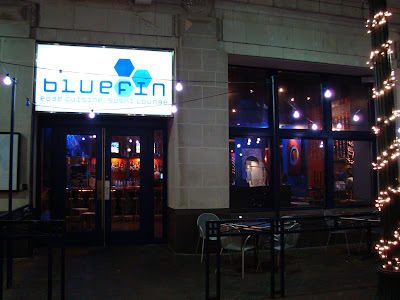 For dinner we went to Bluefin for sushi. It was delicious. I was particularly fond of the fatty tuna sashimi. Afterwards we headed out to The Flying Saucer Draught Emporium to check out their beer selection and boy was it impressive! 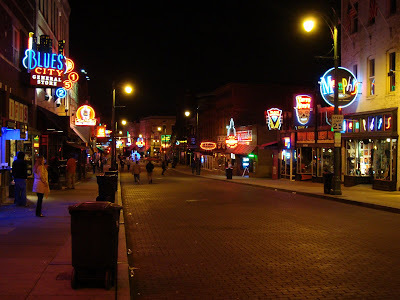 We then got a mini-tour of the "birth place" of blues, Beale Street. It was a pretty quiet night, but was easily discerned as a place known for having lots of fun and having a crazy atmosphere. We opted for a less wild time, and strolled down the street. Greg and I decided to explore the town a bit. Memphis seems like a really great city with lots of galleries, cute shops, and a place to get yummy coffee. Unfortunately on our walk, I was distracted and hit my head into a brick wall. I got too caught up in our conversation and turned my head to say something and misjudged where the wall was. My head hurts! Ouch! It's sore and tender, but I'll survive. Valentine's Day is a big jewelry day, or is it? For those who sell jewelry, you may find this poll interesting. It's cold outside. An art button suceeds as the finishing touch on a handmade neck warmer. 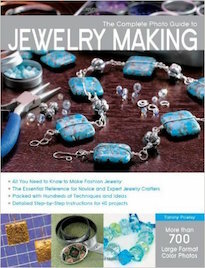 Need to get your jewelry business office skills up to date? Check out this source. A new design resource for beaders--check it out! Carmi creates a broach using old fashioned rug hooking techniques. Inspiration comes to Melanie in an unusual form... an earworm and musical artist that she dislikes. 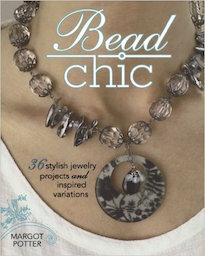 Seed bead mania hits Jewelry&Beading. Wanna play? 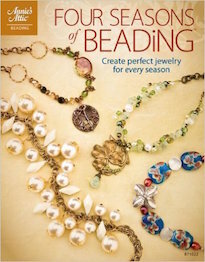 Jean is honored to have her jewelry design book, Links, by Jean Yates, get a jolly good review by a really cool beading magazine over in Great Britain! Melissa is inspired by dream catchers to create a spring necklace. 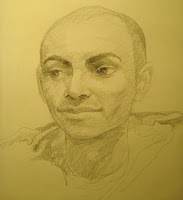 While we were in Tucson, I sat for Greg and he did this portrait of me in pencil. Someone was making me smile and smirk throughout the entire drawing, so Greg captured me with that particular expression on my face. I think it looks a lot like me and distills aptly the mood of the moment. We left Tucson this morning. My heart was heavy. Saying goodbye wasn't exactly easy for me. I thought about my friends and the fun I had and the people I met. I thought about the warm sun on my face and the birds in the trees. I was homesick for a place I've never truly lived in. 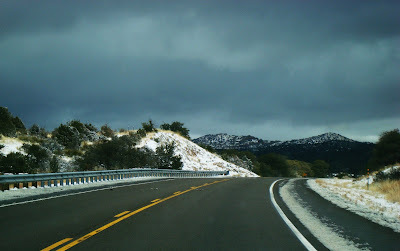 During the night, the snow had fallen and the normally brown and dusky mountains in the background were snow-capped and all white. It was strange and some how fitting for our last morning in town. We were making pretty good time. 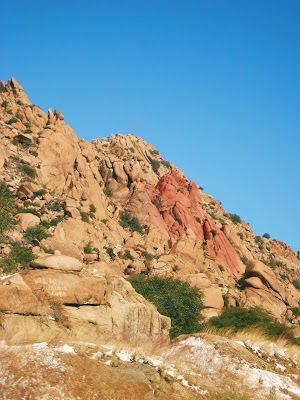 Greg had decided on a short-cut on up through Silver City, New Mexico. 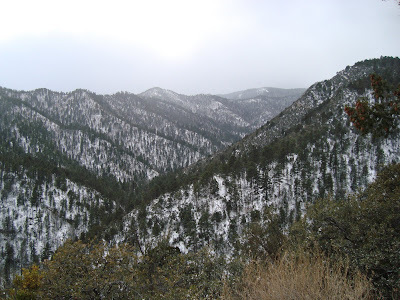 We would be going through the Gila National Forest. At first the roads were pretty deserted, level, and the speed limit higher. But eventually the flatlands turned rough, and the roads zig-zagged higher and higher. The storm was at our backs, the winds howling and shaking the mini-van. We snaked our way through, sometimes over ice and snow, curling and bending with the ribbon-like road. Greg was starting to get tired of the constant weaving through the labyrinth of road, so we briefly stopped. I got outside and took a quick picture. Although the view was amazing and the ride absolutely gorgeous, I knew that it was a treacherous place. 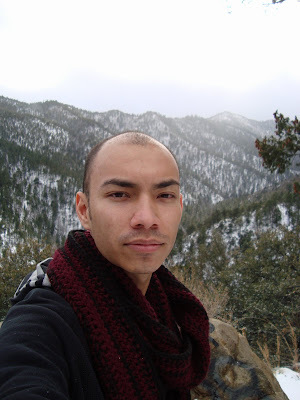 If the wind blew any harder, I would have been in danger of being swept off the mountain-top. It's not noticeable in this picture, but the road hugged these mountains and we crawled through them. Although we weren't going very fast, we still ended up shaving off a little bit of time and the prospect of getting to the hotel quicker did much to balm the stress of driving in such conditions. It's funny how one minute you're riding through wintry white snow and the next you're in the middle of the sun-soaked desert. The rocks, the trees, everything seemed different. I didn't get any pictures of it, but we passed through a cute, although somewhat deserted little town of Hillsboro, New Mexico. I was impressed with the many cafes and galleries. Though not a sign of human life could be seen, I was still smitten with the quaint town that boasts no more than 250 (give or take) citizens. Is it me, or does the sky somehow seem bigger here in the Southwest? 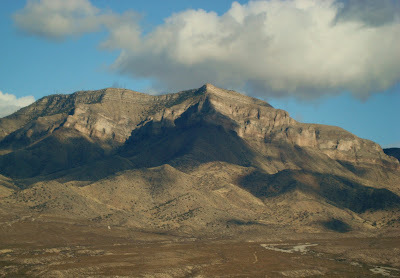 Although I love the beach and I love the mountains of the Carolinas, I still am utterly charmed by the Southwest scenery. Part of me feels like I should up and pull a Georgia O'Keeffe or Agnes Martin. We made it here in Amarillo, Texas just after 11PM. We'll be staying here the night and taking off early in the morning. Our hope is to reach Memphis early. I would very much like to explore it a bit before we head on back to Asheville. Tonight is the last night that I'll be in Tucson. We're leaving in the morning to return to North Carolina and drive across country. I am a little sad about it. It's true that there are a lot of things that I miss and am looking forward to getting back to, but the desert is in my heart. It's in my heart and it just so happens that many of my good friends convene upon it a handful of times a year. I get to see some of the most creative and brilliant people I know. I am moved by their beauty and their ideas and the things that they make. I am moved by them. 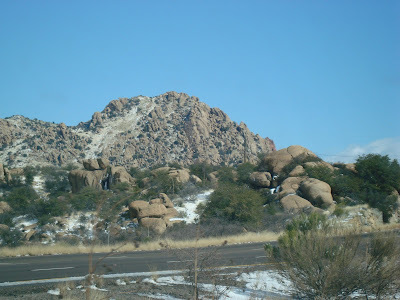 The 1,111th post that I've made on this blog is devoted and dedicated to Tucson and the time that I've just spent in it. I've had such a delightful time. Our experience would not have come together either if it weren't for the Fusion Girls, the folks at Interweave Press and Kalmbach Publishing, the fine folks at Softflex and Beadalon, all of the other vendors, and especially all of the customers who came out to see me at the shows. I had a most excellent time connecting with new faces and old ones. You all were great! Today is the last day that I'll be at the shows! We'll be heading back tomorrow and driving back across country. If you'd like to meet up or say hello, please drop by the Tucson Bead Show at the Double Tree Reid Park. Our table is right next to the registration table inside. I'd love to see you, what you've been making and meet a couple of new folks (or reconnect with some familiar faces)! Wear a Green Girl Studios piece and get a free bead! Today was my last day at the Best Bead Show. 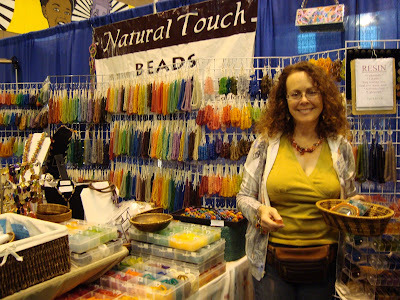 Tomorrow I am headed to the Tucson Bead Show at the Double Tree Reid Park. Make sure to drop by if you can. I was really sad leaving everyone. The Best Show is one of my favorites. I look forward to it every year. It is filled with some of the most amazing and creative people I know. 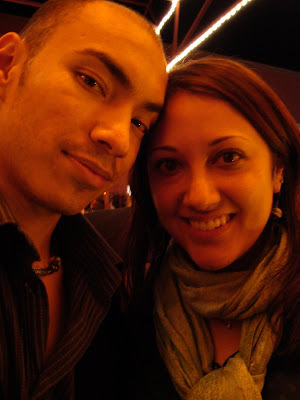 When Aveesh was in town in Asheville, I was fortunate enough to meet his friend Vic. 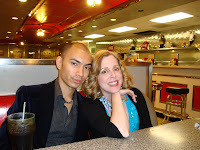 Vic is the boyfriend of Judy, the owner of Natural Touch. Natural Touch makes and sells really lovely resin components. Over the past few days, I've had the wonderful opportunity to get to know Judy and her wonderful work. She really is a doll and Vic is a lucky man to have her! 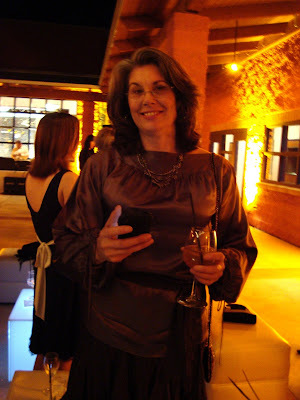 Another of the new friends that I've had the opportunity to get to know is Joyce Rooks. Joyce is incredibly talented and supremely intelligent and loaded with wonderful stories. 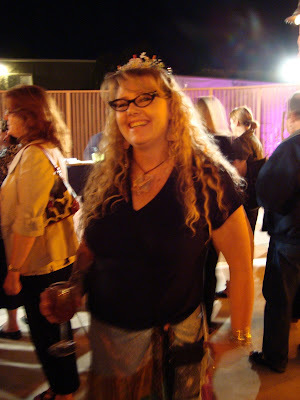 Did I mention that I covet her beads? She's great! One of the main reasons that I love the Best Bead Show is that I get to see Candice Wakumoto! Seeing her and her husband Paul and fellow Hawaiian Aletha Donovan is such a pleasure! They are really stunning individuals. Candice is a very talented artisan who makes some delicious-looking PMC. 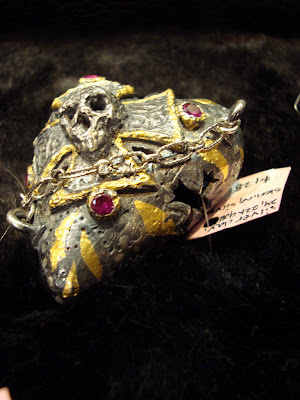 Above is an example of one of her new skull encrusted pendants. Isn't is amazing? 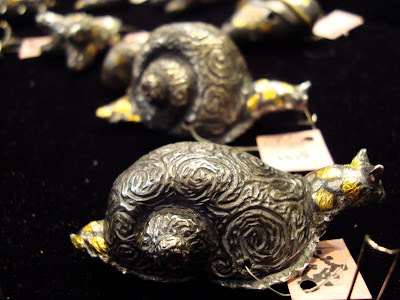 Above is a shot of her new snail pendants. I'm going to start saving my pennies for one of these. What I really appreciate about Candice's work is that she's not afraid of size. I think a lot of artisans who work in PMC are worried about the expense of big PMC pieces. And it's true, working big costs more, but the end results are just killer! They are opulent and decadent and really a nice new direction. I will miss them and all my other friends at the show. I feel so horrible, because I didn't get to spend nearly as much time as I would have liked visiting with everyone and catching up. The Best Bead show in many ways is pretty aptly titled. At the suggestion of the Beadalon crew, we decided to meet up at the Pearl after the Swarovski party (instead of going to the authorized after party at the Marriot) with the Fusion Girls and Margot Potter. None of us had heard of the Pearl before, but against our better judgement, we agreed. At some point in my life, I might have enjoyed this, but it wasn't my cup of tea this particular night. It was a strange feeling of being a little bit dowdy and not being interested in dropping it like it was hot and melting into a crowd of booty dancing music. We never did meet up with the Beadalon folks. But regardless, we still tried to make the best of it and have a good time. 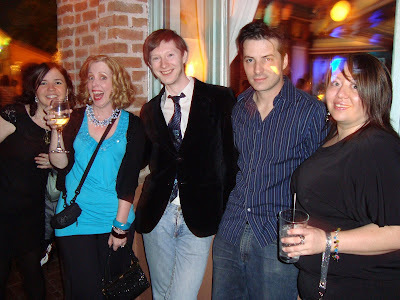 Above: Katie Wall of Fusion Beads, Margot Potter, William, Greg, and Lindsay Burke of Fusion Beads. We eventually gave up on trying to hear each other's conversations over the loud music and retreated to a restaurant to continue our words. We landed in Sullivan's. Unfortunately the kitchen was closed already and we could only enjoy our drinks and each other. After a while, Margot Potter and the Green Girl Studios crew headed out to a 24 hour diner and had some tasty, albeit greasy, treats. I've really enjoyed spending time with Margot and the Fusion Girls and all of my friends here in Tucson. 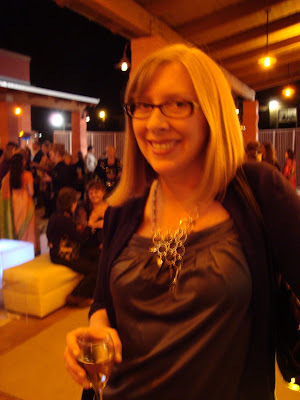 The Green Girl Studios crew was lucky enough to get an invitation to the Swarovski Party here in Tucson. We were very happy to accompany our good friends from Fusion Beads and my buddy Margot Potter. They are awesome! The night was pretty much a blur and I really wish that the party lasted longer... that we all had a chance to connect more. I can feel the desert slipping through my fingers and it makes me a little sad to think that in a short time, all of my creative friends will be back in their respective corners of the world and that I will be far away from this and that it'll be some time before I see any of them. Above: The talented Jamie Hogsett and I pose for the camera. She's such a gem! Not only is she a wonderful designer, but she's an accomplished author (of five books and magazine articles) and she's a whole heck of a lot of fun. I always like seeing Jamie. She's a genuinely good person. Above: The delightful Starr of the seed bead Mecca, Beyond Beadery. She's an awesomely kind woman who has a big heart full of honey and sweetness. 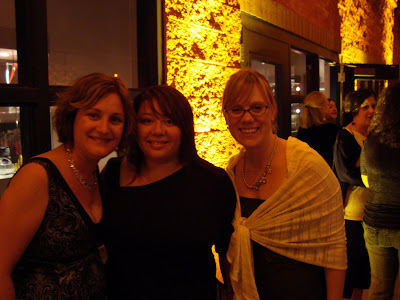 Above: Marie and Lindsay of Fusion Beads and Melinda Barta of Beadwork. These gals are great! All of them are such creative and inventive ladies. 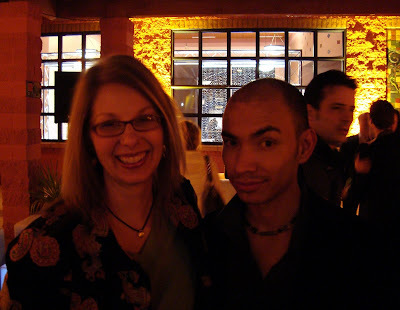 Above: Mary Wohlgemuth from Kalmbach Publishing and me (with Greg in the background). Mary and I have been running into each other a lot lately. She's very funny and carries around sketches of fertility charms. I hope I've not disturbed her with my often sassy and very straightforward observations. Above: The ever-lovely Danielle Fox of Stringing magazine. She and Jamie Hogsett were were wearing the same blouse. I didn't notice but it made me giggle when they pointed it out. It was my goal to get a picture of them together. But alas, I was doomed to failure. I figured that having them together in the same picture with the same blouse would cause some kind of space-time-continuum rift and the night would last forever. 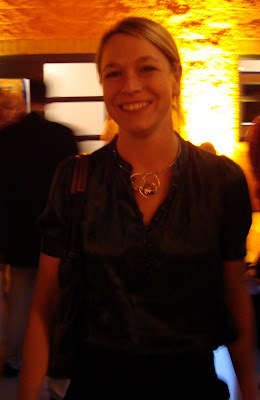 Above: A good, but slightly blurry picture of Katie Hacker. She just came out with a book with Fernando Da Silva and Margot Potter. They've all done an excellent job on their new book together. Above: I love Margot Potter. She's just an adorable peach and really funny. We had a lot of fun sharing stories and laughing over the nuances of life. Margot Potter is AWESOME! 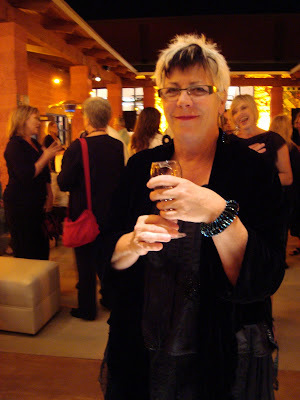 Above: Jill MacKay is such a beautiful and lovely creature. Although she hates photos being taken of her, I couldn't help but snag a couple. She really is such a down to earth person. 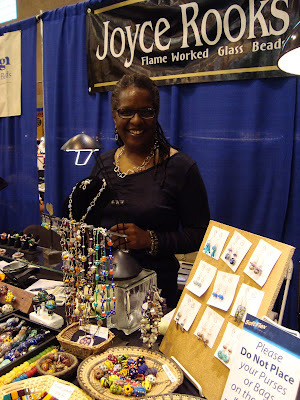 She did jewelry for Star Trek and Guiding Light, and has several nation-wide lines, including one in Michael's. Even though she's had many successes, she's still fabulously humble and a truly a talented designer. Above: Marcia DeCoster was joking about editing her pictures kindly. This picture needs no editing at all! I think this is probably one of the most striking pictures I've taken of a person. It almost seems staged. Her bracelet is displayed nicely and the lighting is perfect! It's very glamorous. The night flew by. I met new people, caught up with ones I haven't seen in years, and still I wish there was more time to connect. I danced. I laughed. I had a wonderful time. 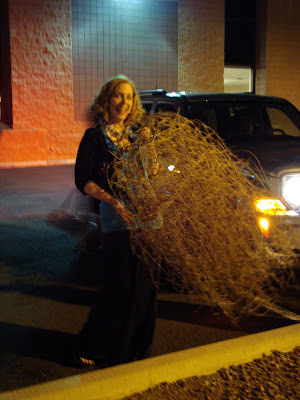 To end the Swarovski party, Margot Potter found a tumbleweed in the parking lot. How apt for a party in Tucson! I stopped by the Softflex booth to talk to Jamie Hogsett and see the wonderful new gadgets that she was demonstrating. Apparently Softflex has just released new colors and a more environmentally friendly-cored wire. The Trio comes in all sorts of pretty named sets of three. Ask Sara of Softflex, a.k.a. 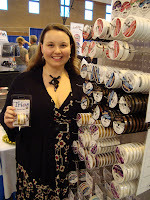 Sara Hardin, showed me to the wire and introduced me to the new product. We had a small get together here at the house. Rupa Balachandar, Laura Belkin of Talisman Associates, Joyce Rooks and her husband Jerry, and later Katie Wall and Lindsay Burke of Fusion Beads came out to join us, part of the Green Girl Studios crew. To me, preparing food with love and good intentions and then sharing this with friends, both old and new, is a powerful thing. The ritual of feasting, of celebrating, of cooking, goes back to the dawn of humankind. I like the idea that we were able to do this - to celebrate at a time when we are gathered for beads, the earliest marker of civilization. 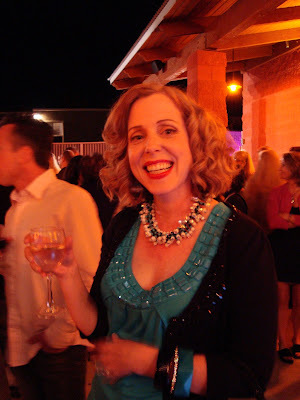 It was a good time; toasting to creativity and to friends, the makers of ideas and objects. Together we can make magic and be the change that we wish to see in the world. 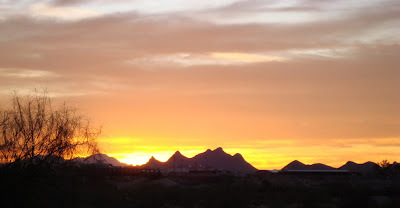 Above is a picture of the sunset as seen from the parking lot at the Kino Center. It's beautiful, though it doesn't hold a candle to my first in Tucson years ago. Very near the spot this photo was taken I saw one of the most striking and brilliant sunsets I've ever seen in my entire life.